Yair Emanuel's Judaica online store is proud to present our colorful collection of Embroidered Matzah and Afikoman Covers. 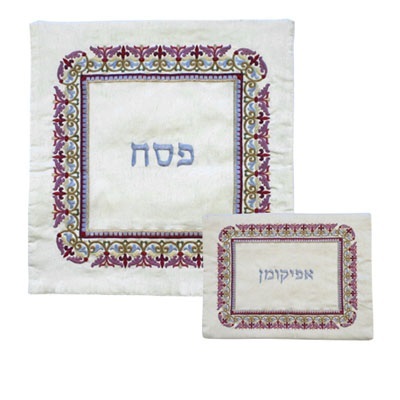 Theses gorgeous matzah and afikoman covers are a beautiful addition to your Seder table. The covers are made of cream colored raw silk and are then embroidered with multicolor thread. 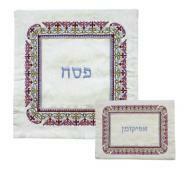 These matzah and afikoman covers are framed with an elaborate design in purple, green, blue, and red. In the middle of each cover is embroidered the word “Pesach” and "Afikoman" respectively, in Hebrew, celebrating our liberation from slavery in the land of Egypt. The Matzah cover has three sections inside to separate the three Matzahs. The covers can be bought as a set, but are also sold separately. It’s the perfect gift for Passover, weddings, and house warming. These elegant matzah and afikoman covers match the Folding Basket MB-3, which is the perfect place to store matzah on your Passover table. Sizes: Matzah Cover 16" X 16" Afikoman Cover 8" X 12"